What religion is Barack Obama? 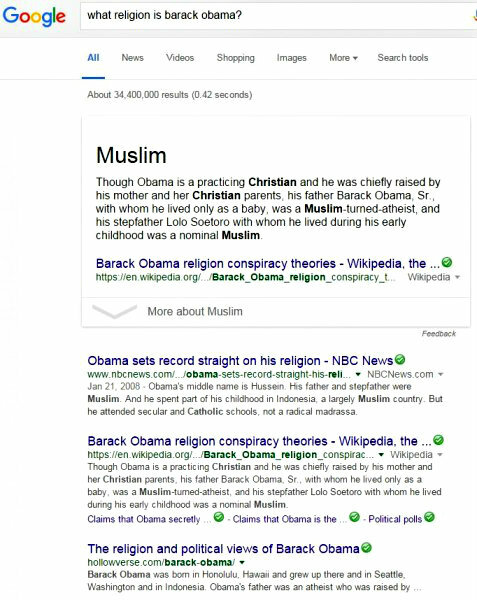 On 7 January 2016, I asked Google, ‘what religion is Barack Obama?’ After considering the problem for .42 seconds, Google offered more than 34 million ‘results.’ The most obvious answer was at the top, accentuated by a rectangular border, with the large word ‘Muslim.’ Beneath that one word read the line, “Though Obama is a practicing Christian and he was chiefly raised by his mother and her Christian parents…” Thank you, Google. Google is a treasure trove for religious historians. This search and the results alone could fuel days of conversation for my classes. What does it mean to ask an electronic aggregator to answer a question about individual values (belief) that cannot be physically discerned? How do we account for the complicated initial answer (Muslim … practicing Christian … her Christian parents)? The Obama answer came from a Wikipedia page, a web hosting site that allows users to modify the contents. All in one, Wikipedia is democracy and anarchy, the best of information sharing and the worst. Whether you accept it as a source for citation or not, well, that’s up to you. In this case, we have the Obama religion wars in black and white print … err… in color on a screen. I scrolled through some of the pages containing these Google ‘hits.’ There were articles from academics, newspaper reports, and blog rants. Many times, the same stories or snippets of information were ‘shared’ (is it plagiarism if it’s on the web?) It seemed that there were as many angles on this one topic – the religion of Obama – as there were voters in the elections he won. Image credit: Screen shot of search “What religion is Barack Obama?”, courtesy of the author. Used with permission. I’m as interested in the process by which humans search for and locate answers to our questions as the answers themselves. In the case of Obama’s religion, this process of seeking and finding may be as informative as the answers Obama gives himself,or the church or mosque or synagogue he attends, or what some pundit or academic has to say about him. The reality is, when most of us want to know something, whether it is about religion or anything else, we ask website aggregators. Years ago, ‘he’ may have been humorously named ‘Jeeves,’ but these web services play the role of priest, librarian, friend, and even god. When we want to ‘know’ something, we turn to the collective of human- and cyber-created information through search engines like Google. When it comes to religion and politics, this new god of Google gives and gives and gives. This is particularly true for one topic that has run through my research during the past fifteen years: the question of “Was the United States established as a Christian nation?” Obama dealt with this explicitly in 2008 before he was elected president. Numerous historians have written brilliantly on the topic. But one text that has been largely neglected was a petition from African Americans in Massachusetts in 1777 for their freedom. In it, they described the land as a “Christian country.” Those searching for ‘Christian nation’ may not find the piece because of the slight (is it slight?) difference between ‘nation’ and ‘country.’ Thanks to Google (and some diligent librarians and archivists), we can locate not only transcriptions of the petition, but also scans of the original document. But sources like this, as is the case with anything else placed and found on the World Wide Web, are not without their own set of problems to consider. First is how the documents are presented. One organization presents the petition as an example of American love for freedom and Christianity. Another sets it as an indication of white supremacy. Beyond such content framing, what would the materiality of the source tell us that we cannot see or feel on the computer monitor? Was the paper perfumed or scented at any point? Does capitalization (or lack thereof) matter? Were or are there any other pieces of data or information surrounding the page that have been removed? How heavy or fine was the paper? All of these seemingly little things may matter, just as our ability to find more than 30 million results to the question of Barack Obama’s faith. One dilemma of the Information Age is how to deal with all of the information we have. Another is to deal with what information we think we have, when in fact we may not. So when it comes to the religion of Obama, neither I, nor Google, nor any of us will ever ‘know.’ As to whether the United States was, is, or will be a ‘Christian nation’ (or ‘country’) is another question we cannot ‘know.’ But that’s the beauty of religion and perhaps the Internet itself: the point isn’t always to know. It’s to believe. Featured image credit: President Barack Obama and First Lady Michelle Obama attend a church service at Metropolitan African Methodist Episcopal Church in Washington, D.C., on Inauguration Day, Sunday, Jan. 20, 2013 by Pete Souza. Public Domain via Wikimedia Commons. Edward J. Blum is Professor of History at San Diego University. 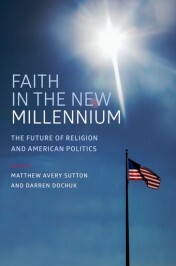 He is a contributor to Faith in the New Millennium: The Future of Religion and American Politics. What I have trouble understanding is how anyone can pretend with a straight face that the religion they just happened to be born into is somehow the one true religion. It amazes me how easily these same people look at other religions different from their own and clearly see that the people following those religions are ignorant, uninformed and praying to gods that don’t really exist. The obvious question becomes if people can easily see the falsity in other religions, what is it that prevents them from seeing the exact same thing in their own religion? Patrick it is called “Faith”. If you bother to read a religious book of any kind the one word that you will find in belief of God that you cannot “see” is the words belief and faith that are written. Your answers are there in the holy books of all religions. So Patrick if you cannot see air does it really exist? Obama is a Jew through his mother and Judaism is his religion hence the huge Menorah on the White House lawn over CHRISTMAS!!! Everything else is a smoke screen. Question is: “Does Obama attend his Church of preference weekly? a retired Obama staff member mentioned that he NEVER saw him and family go to any Church on Sundays. Google does not have all the answers but we have eyes and ears and something in the middle called brains. Not everyone watches the liberal AND conservative news nor research the parties involved independently of the news to get a balanced opinion. It doesn’t matter what religion he was born with, it matters what church he attends now and what spirituality he displays now. After reading the article and others, my conclusion is he is nothing and believes nothing. Perhaps he is more like his athiest father. I certainly do not believe he is Christian. Michelle dragged him to Jeremiah Wright’s hate mongering sermons in Chicago and after that, nothing. Yes, he seems to favor Muslim, but perhaps only because there is a link, again, to his elusive father. From my perspective, he does not seem to have the strength someone who relies on their faith has. He has not been a strong leader and that harks back to the absence of a father figure and a strong faith to carry him through. Very respectful man and I wish him the best in the near future.good luck Am proud that he was once a black president of the United states of America and he deserves it. I don’t have a problem with Muslims and their faith as long as I am left to worship whatever religion I choose without judgement and reproach. Noone has the right to judge or force their faith & beliefs onto another. The world would be a better place if we had respect for each other and our chosen path. It should not matter what religion you are or if you’re not religious at all! I was raised Southern Baptist switch to Seventh Day Adventist then back to Southern Baptist after that Pentecost churches and now I attend no church. To me it is the person’s choice to attend whatever Church they desire or if they desire to be an atheist then that should be their business! I don’t have the right to tell anyone that their religion is wrong and they’re all condemned to hell nor does anyone else have the right to tell me because I don’t attend church anymore I’m going to hell! First of all there’s no such place as hell and if you actually studied and read the word of God you would know that! Why can’t we just all get along whether we are Catholics Baptist Pentecostals episcopalians Lutheran’s or atheists with a few gnostics thrown in for good measure? It does not matter what religion the Obamas practiced or the fact that Trump doesn’t attend any church at all. What matters is how you love and treat one another and in the case of Obama he treated others with dignity decency and class where as Donald Trump prefers slandering outright lies and shows no class! Obama was a much better president than Trump will ever be and I will be glad when America gets back to showing dignity decency and class toward one another! I am really confused. You are right in saying he did not speak ill of anyone. He was always dignified , respected no slandering of his name, a true father and husband. So why does it matter so much about his religion when our country is made up of so many different religions . None. Muslim, maybe. Christian, yes. Barack, his mother and step father registered him as a Muslim and renewed that declaration every year he was in school in Indonesia. That is a pretty clear declaration of faith. Even for a 6 to 9 year old. Can a person go back after denouncing Christianity by accepting another faith? This was a fascinating read! I invented a religion for an alternative history reality in the novel I recently shared on Kindle. I’m afraid the story is a bit short on ignorant bigots but I should be very interested to know what an academic exploring politics and religion would make of it. It’s called ‘dancing through two windows’. In two words: who cares. He is consistently considerate and caring.